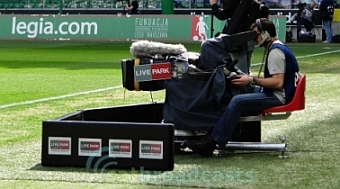 SATBROADCASTS.com looks closer on production of live transmissions of the highest Polish football league. This article was previously published in 2012 (some details might be out-of-date). Never before in the history of Polish football a league has been produced on such a high level: “All games in HD”, “Multilateral Running Orders”, “standardized graphics in the look and feel of the league”, “unilateral and multilateral feeds to domestic and international broadcasters parallel” are just a few key words of features that were implemented by LIVE PARK. Thanks to Eurosport 2, Monday matches of T-Mobile Ekstraklasa are shown in over 20 countries: Albania, Bosnia and Herzegovina, Bulgaria, Croatia, Montenegro, Czech Republic, Denmark, Estonia, Finland, Germany, Hungary, Iceland, Kosovo, Latvia, Lithuania, Macedonia, Norway, Poland, Romania, Serbia, Slovakia, Slovenia, Sweden. Total range of stations reached 15.6 million households. Since the autumn of last year all Wisla Krakow matches are transmitted by Israeli television Sport5. One game in each round is shown live also in Cyprus, and three meetings of each series in 17 countries in Africa on Zuku Sports.